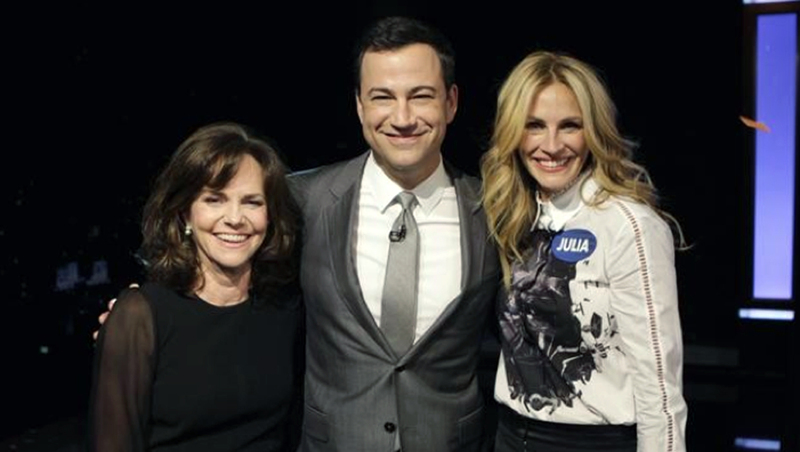 Julia Roberts, Sally Field compete in "curse-off" on "Jimmy Kimmel Live"
Who would have thought Julia Roberts and Sally Field can curse like a pair of sailors? The two stars, who have both been awarded prestigious Oscars during their lengthy careers, proved they're familiar with their share of swear words during a joint appearance Monday night on "Jimmy Kimmel Live." The two veteran actresses, who co-starred together in 1989's "Steel Magnolias," competed against each other in a "celebrity curse-off" match on Kimmel's late-night show, and neither went soft on her opponent. "Why am I in a curse-off with 'The Flying Nun?'" Roberts asked out loud at one point. "How does this happen?" "We'll see who's the 'Flying Nun,'" Field retorted. The match got intense at several points. Roberts had difficulty coming up with new curse words. "Go f--- yourself!" Roberts eventually blurted out in desperation. "That's three words!" Field reminded her competitor. Find out who won the contest by watching the video below. The winner may surprise you. "Jimmy Kimmel Live" airs weeknights at 11:35 a.m. ET on ABC.